After a little research, I discovered that Marceau's world of mime was "a flame" set against the dark backdrop of his own experience, namely, the Holocaust. The youthful Marceau (née Mangel) not only worked with the French resistance, but also rescued hundreds of Jewish children by helping them cross the border into Switzerland by using his acting and miming skills. Six years before his death in 2007, he was awarded the Wallenberg Medal for his heroic acts during the Holocaust. Marceau's "silent resistance" saved lives, even his own. After his father perished in Auschwitz, Marceau gathered up the threads of tragedy, grief, and stubborn joy to heal the world with silence. He said, "I have tried to shed some gleams of light on the shadow of man startled by his anguish." Marceau was drawn to the idea of silent storytelling by watching Charlie Chaplain as a boy, and after the war, he found that silence was the best way to remake the world: a world where invisible emotion became visible, where tragedy and comedy found integration in a transforming whole. "Mime," he said, "is particularly suitable for showing fluidity, transformation, metamorphosis." If we think of the world in Marceau's terms — fluidity, transformation, and metamorphosis — then we might catch a glimpse of the universe as unfolding in stories, a world in process, ever-pregnant with divine story-possibilities waiting to be born. Marceau captures the raw truth of the world in all its tragedy and evil and beauty and comedy and freedom of choice, framed in silent story — and hope. It reminds me of what Whitehead calls "tragic beauty," that is, transformation of even the most painful stories into a rich and poignant harmony that heals and remakes the world. Marceau's work reminds us that, from time to time, we may need to transcend words that divide or limit in order to reach the universal truths that unite and heal. While watching Marcel Marceau express the whole spectrum of universal human feeling in stories without words, it occurred to me that I might be observing a vital form of prayer. It seems to me that this special kind of silence, which allows for the full expression of feeling, can refresh our spiritual lives by its sheer audacity, that is, the stubborn faith that silent storytelling can bypass what we thought was crucial for stories, i.e., words, and offer up a transcendent wordless story-prayer that can serve as a flame against the dark places within our souls, and against the ever-darkening landscape of our world. Of course, we may prefer to watch mime as performance art rather than mime ourselves, but I wonder: can we mime our feelings to God as an intentional form of prayer? Alongside other forms of contemplative prayer and meditation, we might want to make room in our practice for "mime prayer." Why? Because our stories are important, and our feelings about our stories are sometimes too untamable or painful — or even too beautiful — to pin down in words. But our stories need to be told. Miming, alone or in companionship, can help us tell our stories with our entire bodies, our whole being. Such a prayer unfolds in time, reflecting the fluidity, transformation, and metamorphosis inherent in the universe. Miming our stories and feelings may touch the world — and God — in ways that transcend and challenge our static, fatalistic, despairing notions about ourselves and the world. Silent story-telling reminds us that the future is still open, that we are part of the story of creation and re-creation. Such co-creation with God and the world asks us to express a deep and authentic truth about ourselves or about the way we see the world with whole-body participation. With every gesture, our body tells of something new, a freshly born truth that perhaps even our conscious mind does not yet know. In a world of too many words, where people talk past one another, and where words have themselves been traumatized with perverted meanings, we need to let words rest now and then: "Let all mortal flesh keep silent," the hymnist writes. What we do with silence matters to the whole, for just as the "rests" in music are part of the music itself, so our silence is part of the whole symphony for which we were born. 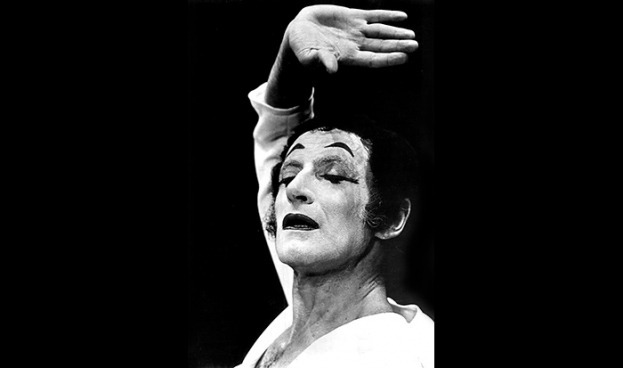 In the resting places of excessive words and noisy voices, we can, with the inspiration of those like Marcel Marceau, offer up our "silent resistance" and help remake the world in a deeper harmony.